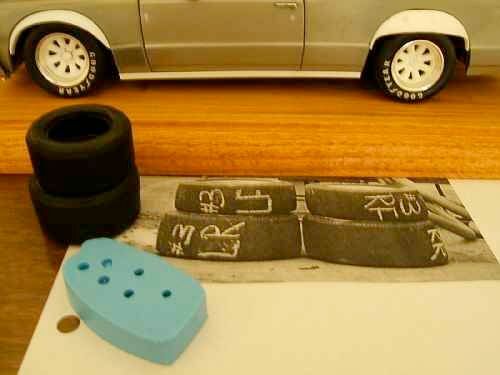 To spread across projects while serving my current Tempest Gray Ghost effort, I fabricated and created a mold for both GM and Ford axle ends (at least what is visible) as well as grease cap detail to fit into the wheels. Singles of the same are tedious to make, whereas if such do not match across projects, the lasting impression is one of sloppiness. 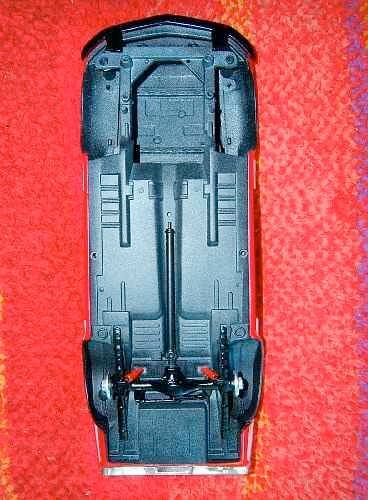 The two-part urethane mold is seen in the photo. Too poor are my images to note what has been achieved in this regard on the 'Ghost', but closer to complete the wheels and tires appear for the effort made. 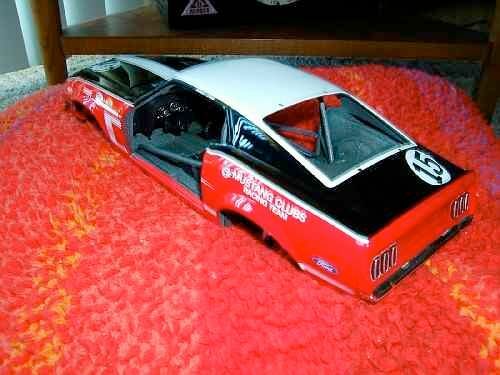 My investigation into alternate tire possibilities continues, with a 1:18th ERTL '65 Cobra 427 yielding some Blue Streak Goodyears with appealing sidewall detail. I hope to clay in the tread detail and create the comparatively simple indented tread pattern appropriate for period dry weather Goodyears upon a master that would be cast further. I know that on both the '70 T-G Firebird as well as the '71 Gray Ghost that the front and rear tires were of the same size, whereas the tires could be employed on the existing Autodynamics Challenger effort and a AAR 'Cuda to be undertaken in time. In addition, I anticipate employing a brass photo-etched mask to reproduce the tire lettering even for the nice footwear on show in the Gray Ghost photos. The lettering may not be quite a precise as seen on the tires employed on the Gray Ghost at present, but crisp masking of such lettering seemed hit or miss, with a slightly soft mask perhaps lending unexpected visual interest if done well. I think too of old race tire bound together as a protective measure seen in run off areas, and rather impressionistic was the masking on the race tire markings examined upon so many. 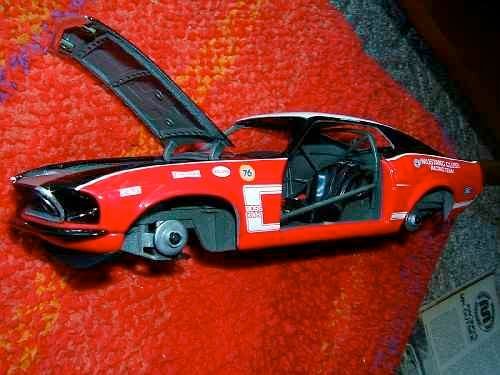 Lastly, a wheel swap on an older project underlines the utility of experimenting to arrive at better approaches to problems. 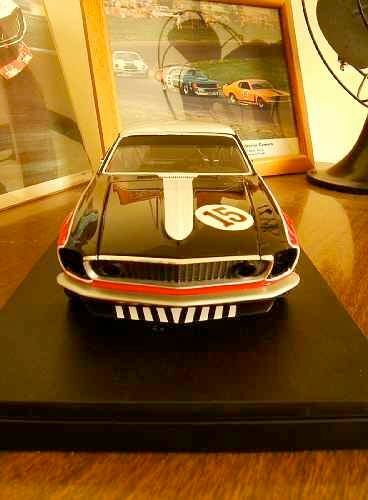 My Welly '70 Boss 302 modified to replicate a '70 BME Parnelli Jones entry for long has worn repainted but essentially standard GMP Minilite wheel castings painted with Testor's Model Master Magnesium aerosol - a shade always felt a bit dark for this application. For creating an improved Minilite master employing better shaped spokes and better exterior wheel lip contour complete with the two untapped air valve dimples on the rim edge, I was able to come up with substitutes prior to applying paint. Continuing, for the selection of Testor's Model Master Stainless Steel (a bit cooler in tone it is) followed upon with a light overcoat of Tamiya Translucent Pearl, a 'barely there' metallic sheen is created, and more like the mag. alloy look I desire. Aluminum tubing is used for the wheel installation centering guide (what is the proper name for these anyhow? 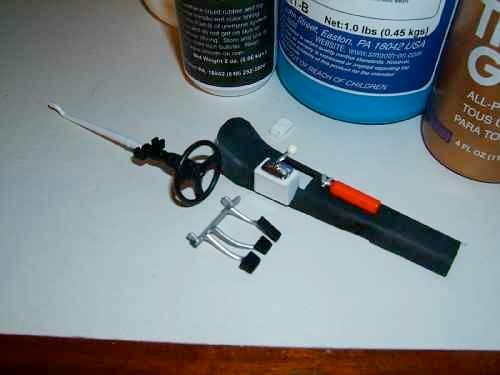 ), whereas drilled and rounded plastic hex rod is employed for the nuts. Thanks and kind regards to everyone here. ...yikes, the lugs clearly need to be sited better! ...new specification, with apologies to Roy Woods if I'm sowing confusion with the poster signature that seems the work of a web artist! Nice progress on the Tempest, Mike. Thanks for the updates. The Mustang wheels look much more accurate to the real car in the revised color but yes, it looks like some rework is needed on the lug nut locations. 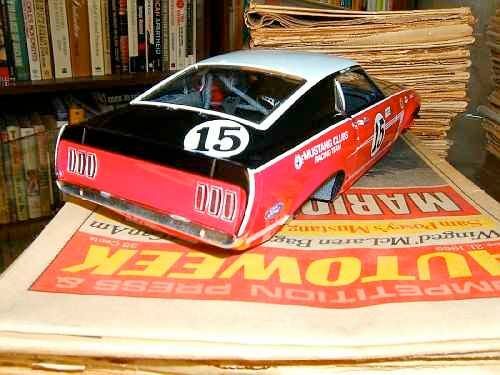 A neat discovery - a rarer cousin of the 1:25 Jo-Han factory plastic promotional model range afforded in 1969. 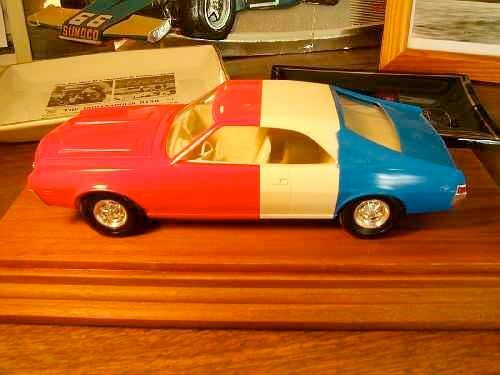 This is a 1969 Trans-Am Javelin promotional, also produced with the colors reversed front-to-back. Usually quite expensive, nearing $300 now, hence this example showing a bit of box rub and less than stellar masking acquired for less is nevertheless desired. 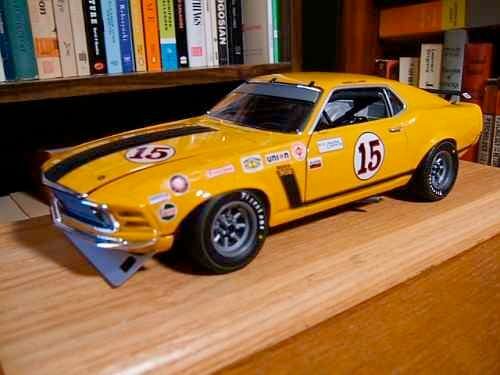 A 1:32nd scale slot car set known as The 1968 Trans Am Javelin Racing Game is seen every now and again for about $200, whereas Jo-Han unassembled plastic kits (with the 1971 Mark Donohue Javelin racer released by AMT employing the Jo-Han tooling) exist for the 1970, 1971 and 1972 racers (each with a 1970 interior!) for about $100 and up. Mike, that's a pretty cool promo model of the Javelin. Nice acquisition on your part. 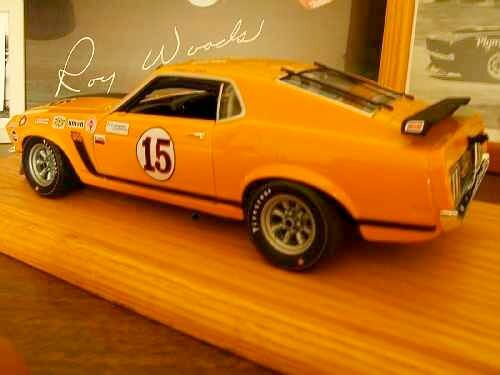 With the red on the front rather than on the back, that would represent the Ron Grable version of the '69 Trans-Am car (or Peter Revson for '68). The white band around the middle of the car seems to be more of a cream color rather than white. Is that true or does the photo just give that impression? 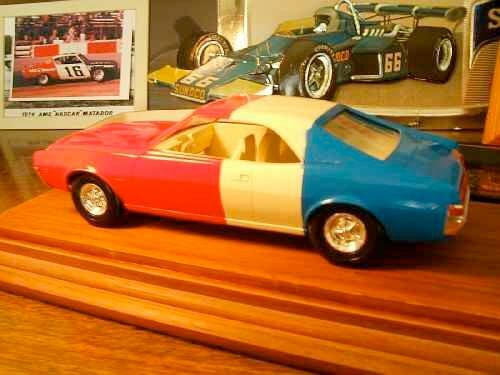 I think the Javelin Racing Game you mention was a pseudo slot car set similar in nature to the Chevrolet Road Rally which was offered in 1967. Is that correct? 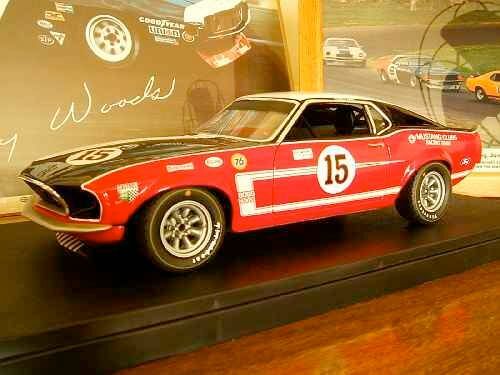 Speaking of slot cars, apparently Slot Mods debuted a new slot car track during the Monterey Motorsports Reunion week using a '69 Penske Camaro "tribute" as the base. It can be seen here. That Slot Mod track is way cool!!! 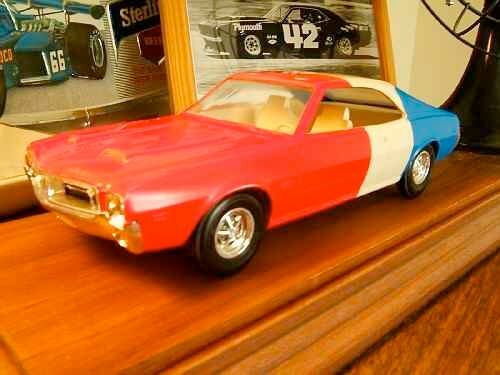 Indeed, I was curious upon purchasing the promotional model if I had a 'Ron Grable' or 'John Martin/Lothar Motshenbacher/Jerry Grant' Javelin based upon the color sequence - mine is the latter. Yes, a rather creamy ivory is seen, whereas it is my understanding that Jo-Han typically did three factory promotional releases in factory colors, and three toy store/hobby shop/department store releases not strictly in factory shades. As with much produced by Jo-Han, anomalies abound and anything might exist as a one-off. 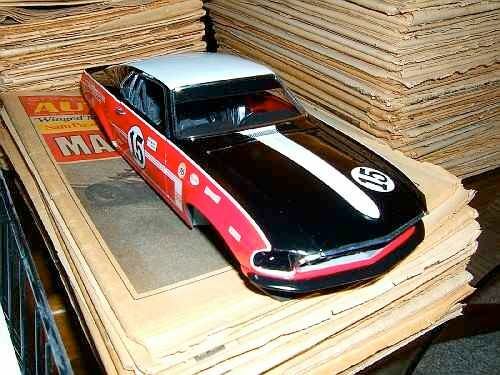 Concerning the 1969 range, I believe the factory promotional releases for the year were Frost White (with a '69-specific stripe package included as a waterslide decal sheet inside the box), Mink Black as well as Matador Red. It seems that Jo-Han simply painted up some Frost White releases for the Trans Am releases, although without a color chip set I cannot verify if they even came so close to match. I've seen dealer promotional boxes with an ink stamp bearing'69 Javelin RWB' or some such identification in the past, hence I don't believe these were strictly toy store issues. Yes, the model does look a bit strange! 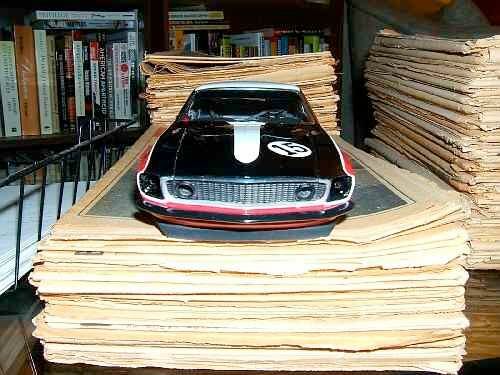 Quality control not the best, but this was just scale model production work undertaken in Detroit, MI. during an undoubtably turbulent period, and only so much could or can be expected by a collector. Yes - it seems one Republic Tool was responsible for quite a series of interesting period slot car sets in the promotional vein. While I didn't see the Camaro game here, it doesn't seem much of a stretch to imagine that Republic Tool also produced the same. 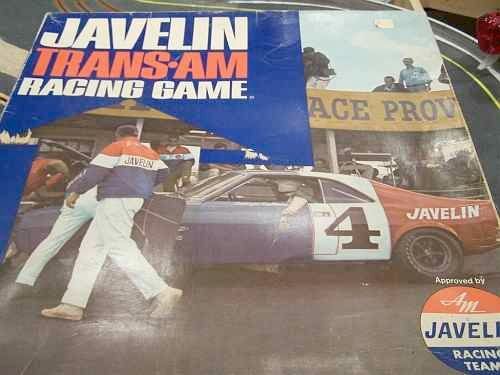 ...as for the Javelin Trans Am Racing Game, I last examined a set for sale two years ago in suburb of Chicago for $275, it being largely complete. This seems an average price, with mint examples demanding more when they do surface. 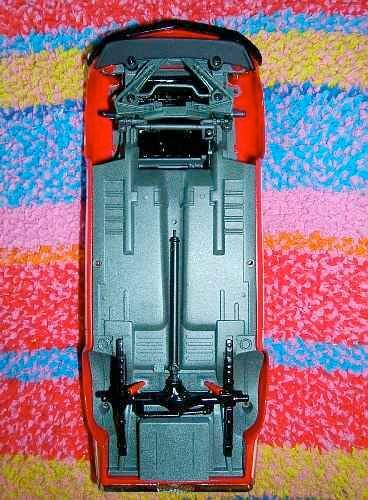 Mike, thanks for posting the link to the Republic Tool slot car page. 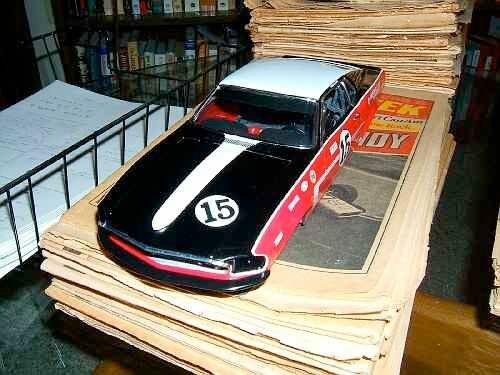 From what I've seen out of the Slot Mods company, all their tracks beat out anything I saw or raced on as a kid. They do nice work! 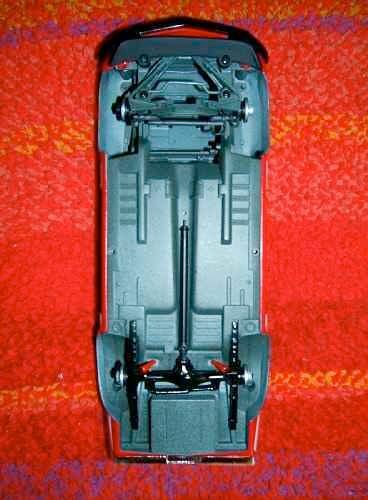 ...with chassis insert painted, albeit wheel arches left 'as-delivered'. ...with arches painted - far better. ...hood non-removable, hence underneath had to be painted 'in-situ.' - although this too looks nice. ...rearmost door jam taped and still red, whereas door jamb forward has Zolatone finish. That looks outstanding, Mike! Very nice job. Very modest material to share - an attempt then to respray '69-spec. Zolatone in black with a dusting of white. Informed feedback from knowledgeable BOSS 302 'heads' advised such, and though hard to discern here, an improvement is noticed/noted. ...before, with front valence panel and front spoiler in place. ...front, with pinstripe work seen and essentially in proportion and even from side-to-side. Headlamp rings, plugs, and requisite 'PJ' decalage to come, hence all appears unfinished. Front spoiler reshaped (it's flatter across the bottom, whereas the ends have been rounded and reshaped as per photos), with the final iteration finished in a textured paint intended to replicate carpet in scale. If it all appears incomplete - well, it is! ...driver's side, with foil applied, plugs rendering the retention strapdectomy effort more or less invisible. The sun screen atop the windscreen has been overpainted with a coat of semi-gloss black, for the sheen of the original was too glossy and inexplicably toy-like. The front bumper was originally chromed, but here has been stripped, reshaped and thinned along the ends, and finally painted black. 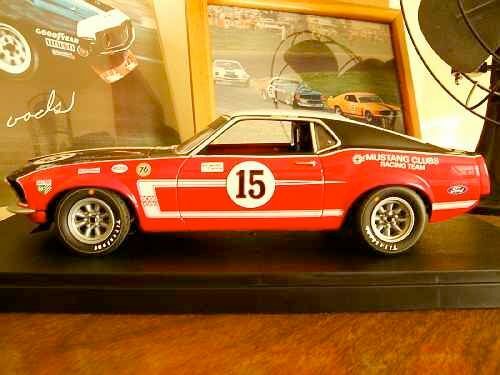 Follmer's Mustang usually (but not always) bore a silver finish, while with the factory clear coat I'm limited in my options to designate a race for I can't remove select tampo markings to reorder things as readily as I'd desire. ...passenger's side, the foil work again, pinstripe work seemingly balanced to other side. Some effort made to correct the severe 'straight ahead' termination point of the side pinstripe to curve the same slightly as per period photos. Red-outlined numerals to come, hence this aspect can and will be improved upon. Foilwork terminates at edge of Zolatone paintwork blending into interior, hence a bit lighter in appearance versus previous efforts to apply same. Getting better, Mike. Thanks for filling us in on the details as you go along. ...I didn't like the tailpanel pinstripe work attempted previously, hence redoing same with inner pinstripe just visible here. ...front spoiler more or less Bryar, NH spec., to be changed to reflect later race- perhaps St. Jovite, but nearly any other early race would require the driver's side headlamp bucket to be repainted white. Cast as one piece, the silver finish applied between the grille mesh and the chromed grille surround was no fun at all to do. Headlamp inserts fabricated last night, hood pin scuff bases (photoetched these) purchased and to be added soon.